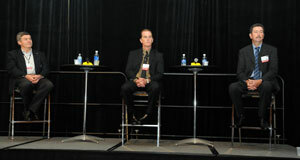 To provide a global perspective on dairy systems the Global Dairy 500 Conference featured a panel with participants from the USA, New Zealand and South Africa. I spoke with Bryan Beeston, Dairy Business Centre, New Zealand, seated on the right. He’s a dairy farmer involved in a collective type dairy company. Bryan says he moved to New Zealand to start a dairy farm and the opportunities there worked very well for him. He says they have younger farmers and opportunities that allow them to stair step their way into a dairy farm. One way they accomplish this is with a share milk system that allows someone to get started with a vested interest in the dairy and they get paid based on how efficient and profitable they are. They can then move up to owning their own cows and plants. Bryan is very enthusiastic about the future of dairy farmer. He says there are areas like Asia where a lot of opportunity exists to help feed people in a growing economy. World Dairy Diary coverage of the Global Dairy 500 Conference is sponsored by .